Great Code News for Tiny Housers! There is great news for tiny house people from the International Code Council. They have changed the minimum space requirements contained within the International Residential Code (IRC) beginning with the 2015 edition, dropping the minimum to 70 square feet of habitable space. 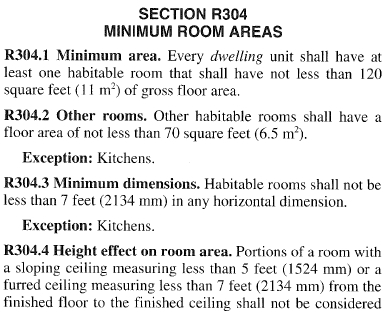 For those that are not fluent in code speak, these sections mandate that a house must be at least 120 square feet and have at least one habitable room, any other habitable rooms must be at least 70 square feet, and any habitable room must have at least one dimension of 7 feet. What this means, is that if there is a habitable space, such as the multi-purpose “great room” that is typical in tiny houses, or an area for sleeping, it must be at least 120 square feet or 8 ft x 15 ft. If you sleep in the same room as you live and cook, then an 8 x 15 room, plus your toilet / bath room (which will add at least another 3 feet for just a toilet) for a total of 8 ft x 18 ft for your tiny house. If you have your sleeping area separate from the “great room”, then it will be considered a separate habitable space by the code, which will add another 120 square feet to the equation. This means that if you have everything on the same level, and are limited to an 8 foot wide trailer, you now need a 8 ft by 33 ft trailer, or 264 square feet! One way people try to solve this issue is to have a sleep loft above. 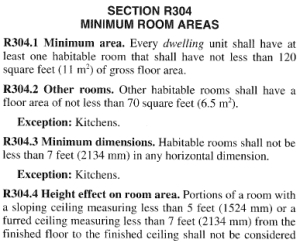 Aside from running into the habitable space square footage issue, sleep lofts in tiny houses run into the problem of Section R301 Minimum Height. The space has to have at least 7 feet of height to qualify as a habitable space. 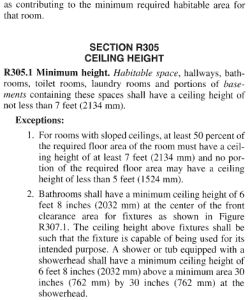 Since the code also requires a minimum ceiling height of 7 ft in the bathroom per Section R305.1 Minimum Height (the most common room placed beneath a sleeping loft), this means that the floor of the sleeping loft will be at a bare minimum, 7 feet 4 inches above the great room floor (7 ft, plus the height of a 2×4 – 3.5 inches, plus the thickness of 1/2 inch plywood or planks). So, add 7 feet to this and you end up at 14 feet 5 inches to the underside of the peak of the roof. If you have a ceiling in the bathroom rather than open joists, add another 1/2 inch. The roof will be at least 4 1/2 inches thick, so the overall height will be a minimum of 14 feet 9 1/2 inches. 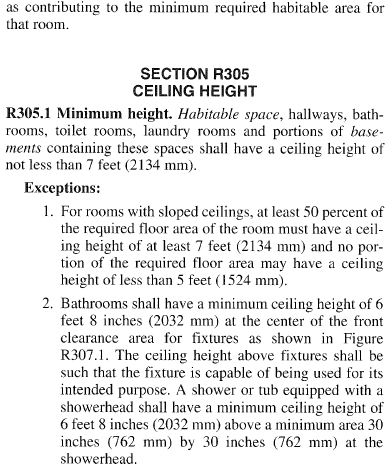 With the DOT max height limit of 13 foot 6 inches, this means that you cannot physically stack habitable rooms and still fit within the maximum height requirements. As such, you would need to ensure that the “great room” has some sort of sleeping accommodation, and a loft would be designated as storage, which can be accessed by a ladder. Only habitable spaces are required to have a code compliant stair, so if it is not considered a habitable space per the code, a ladder is fine. The new updates to the 2015 Residential Code comprise some drastic edits, that allow code compliant tiny homes to downsize even more, as the only requirement is for a single habitable space of 70 square feet. see? A habitable space is now defined as a 7 foot by 10 foot space, that is 7 feet tall. Add a toilet (and some walls for privacy), and you can have a code compliant tiny house in as little as an 8 foot by 12 foot space! Of course, you still have to comply with all of the other portions of the code to maintain compliance, but if you do, you can get tiny! Now, time to temper the excitement a bit. The 2015 code is NOT yet adopted by any jurisdiction in the United States. Most jurisdictions lag 3 or more years behind the latest version. For instance, Madison County Alabama, (which contains Huntsville) is still on the 2003 version of the code. HOWEVER, if there is a provision in the newest form of the code (such as this) you can request that the codes compliance officials give consideration to the new requirement. If you are courteous and can prove to them that it is in the new version, there is a good chance they will allow the updated criteria to be used. Not a problem. Thanks for reading!